The formation and evolution of the Solar System is the name for ideas of how the Solar System began, and how it will go on changing. The accepted idea is that 4.6 billion years ago, there was a very big cloud of gas in our area of space, known as a nebula. All things with mass come together, or gravitate towards one another. This pulled all the gas towards the center. Eventually the pressure at the center raised the temperature so that hydrogen atoms fused together to make helium. The process by which solar systems are created is called the nebular theory. The spin of the planets around the Sun, and each around its own axis, was first caused by the original gas cloud having different density in different places. The spin increased because of the contraction under gravity (conservation of energy). So did the flatness of the solar system's shape. As the collapse continues, conservation of angular momentum means that the rotation accelerated. This largely prevents the gas from directly accreting (moving) onto the central core. The gas is forced to spread outwards near its equatorial plane, forming a disk, which in turn accretes onto the core. Because of the sun's huge mass (99.86% of the whole mass of the solar system), it had very strong gravity. The centrifugal force of the planets going round the Sun balances the gravitational pulll of the Sun. The huge density at its core causes a fusion reaction which turns hydrogen into helium with the radiation of heat, light and other forms of electromagnetic radiation. The next issue is: if the Sun turns hydrogen into helium, where do all the other elements come from? There is only one possible answer: these higher elements came from earlier generations of stars. Huge supernovas which exploded billions of years ago in the neighbourhood of the young Solar System produced the higher elements. Huge stars run through their life cycle much faster than smaller stars. That is caused by the even higher pressures and temperatures inside them as compared with an average main sequence star like the Sun. ↑ 1.0 1.1 Nakamoto, Taishi; Nakagawa, Yushitsugu (1994). 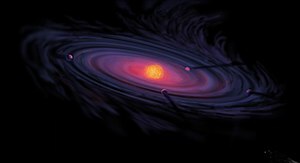 "Formation, early evolution, and gravitational stability of protoplanetary disks". The Astrophysical Journal 421: 640–650. doi:10.1086/173678. ↑ Swedenborg, Emanuel (1734). (Principia) Latin: Opera Philosophica et Mineralia (English: Philosophical and Mineralogical Works). I. ↑ 7.0 7.1 7.2 7.3 Woolfson, M.M. (1993). "Solar System – its origin and evolution". Q.J.R. Astr. Soc. 34: 1–20. For details of Kant's position, see Stephen Palmquist, "Kant's cosmogony re-evaluated", Studies in History and Philosophy of Science 18:3 (September 1987), pp.255-269. ↑ Henbest, Nigel (1991). "Birth of the planets: the Earth and its fellow planets may be survivors from a time when planets ricocheted around the Sun like ball bearings on a pinball table". New Scientist. Retrieved 2008-04-18. ↑ "The Extrasolar Planet Encyclopaedia — Catalog Listing". exoplanet.eu. Retrieved 2017-09-03. This page was last changed on 10 April 2018, at 18:55.